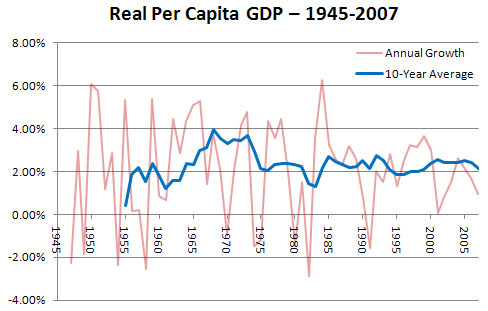 Was economic growth in the period 1950-80 really significantly higher than it has been in the period since then? Yesterday I said that growth rates in those two periods were actually about the same, and today Stuart Staniford and Ryan Avent say I’m wrong. They both have a point, so let’s revisit this. First off, I’m using GDP per capita, not raw GDP, since that’s a better measure of actual economic growth. Stuart suggests that GDP per working-age person might be a better measure, and I’m open to that depending on what it is we want to measure. Still, GDP per capita is the usual measure, so that’s what I used. For the 30-year period 1950-79, growth averaged 3.18%. For the 28-year period 1980-2007, growth averaged 2.53%. There are a couple of conclusions here. (1) The 60s were great, the 2000s were lousy. (2) Overall growth in the most recent three decades was indeed lower than in the three decades of the postwar era. (3) But not by a lot. So I overstated things yesterday, but I’d still say it’s the economy of the aughts that’s a problem, not the entire post-70s era. The fact is that the post-70s economy as a whole simply wasn’t a lot worse than the post-40s economy. The problem during this era wasn’t primarily that growth was lackluster, it’s that middle class wages consistently lagged growth by upwards of a percentage point per year. So to revisit yesterday’s point: yes, growth is important. You can’t have 2% wage growth if the economy is growing 1.27% per year. But it’s not enough. We had good growth for three decades after the end of the 60s and it didn’t produce steady middle-class income gains. Distribution is important too.